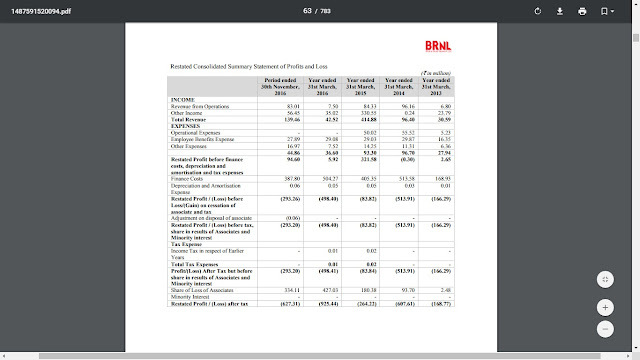 Bharat Road Networks Ltd IPO.... Should you invest? IPO, IPO and IPO everywhere. Its Raining IPOs here and the next one lined up is Bharat Road Networks Ltd. The Issue opens on 6th Sep 2017 and ends on 8th Sep 2017. The issue is for an issue size of Rs 600.65 Crs at a price band of Rs 195 to 205. 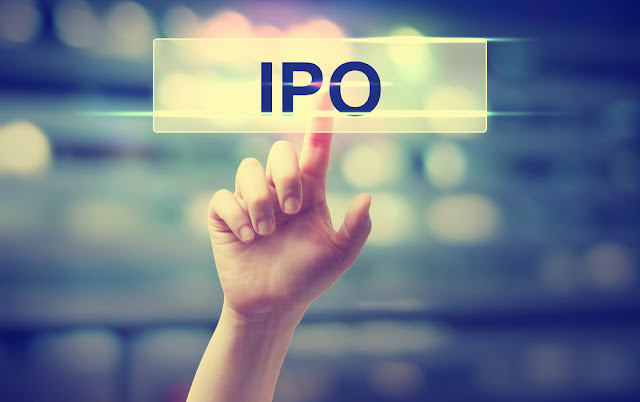 Face value of the shares shall be Rs 10 and the minimum number of shares to apply for one lot is 73. All these seem to be good. So is it a good bet to invest in Bharat Road Networks Ltd? Let’s unwrap the candy shall we? Bharat Road Networks Ltd is a road BOT company in India with focus on development, implementation, operation and maintenance of roads/highways projects. At present, all their projects are implemented and held through special purpose vehicles, either through their Subsidiaries or in partnership with other infrastructure. They are majorly involved in the development, operation and maintenance of national and state highways in several states in India with projects in states of Uttar Pradesh, Kerala, Haryana, Madhya Pradesh, Maharashtra and Odisha through partnerships with experienced EPC players in the local space where the project is located. They have a project portfolio consisting of six (6) BOT Projects, of which two (2) are Projects operational under Final COD, three (3) are Projects operational under Provisional COD and one (1) is a Project under Construction. They are operating toll based BOT Projects wherein they have the right to collect toll or user fees. The Company also generates revenue from project management consultancy and provides project management services to their BOT Projects. The company is promoted by a well known infrastructure company named SREI Infrastructure Finance Limited and two institutional investors under the Make in India fund. The promoter of SREI is Mr. Hemant Kanoria. SREI Infra is already listed and a profitable company to begin with. So we can be rest assured that the money is not gonna be used by the company but is gonna be advanced to its subsidiaries. No matter what the above signify, if the company is not having solid financials to back it up, it’s of no use. So let’s look inside the hood and understand what’s the financials of the company looks like. 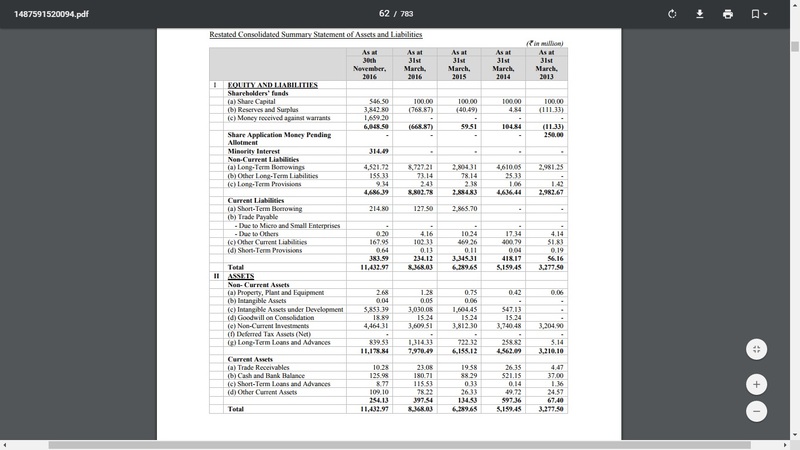 Now this company is a peculiar type as its funds are more applied into its subsidiary and not in itself, it’s best to analyse the consolidated accounts of the company and not the standalone financial statements. 1) The company has been flirting between negative and positive net-worth for the past 4 years. As of 31st March 2016 the consolidated net-worth was at Rs (76.89) crs which is negative. Not done. Seriously not done. However looks like the fresh investments from the Institutional Investors have been added in the 9 month period ended on 31st Dec 2016 wherein the fresh issue has resulted in the increase in consolidated net-worth to Rs 604.85 Crs positive. 2) The company’s consolidated non-current liability stands at Rs 880.28 Crs as on 31st March 2016 and at Rs 468.64 Crs as on 31st Dec 2016. Seems like the proceeds from the investments have been utilised well. 3) Company’s major application of funds are in consolidated non-current investments which stood at Rs 360.95 crs as on 31st March 2016 and at Rs 446.43 crs as on 31st Dec 2016. 4) What might be really interesting to know in this company is that the company has around Rs 303.01 Crs under consolidated Intangible asset under Development as on 31st March 2016 and Rs 585.34 Crs as on 31st Dec 2016. Now these amounts are rights to collect toll once the road projects are done. 5) Now looking into the Profit and Loss A/c, the company’s total consolidated income for the year 2015-16 is only Rs 4.25 Crs and its consolidated Loss for the year was at Rs (49.84) Crs. Further the main contributor of this loss is its finance cost of Rs 50.28 Crs. Even in the 9 month period ended on 31st Dec 2016 the company made a consolidated loss of Rs (29.32) Crs. Hopefully after this fresh issue the finance cost shall come down. Well I have nothing to say about the valuation because practically the company has no PE as its is complete loss. There is no idea what supports this valuation except for the future prospects. So after looking into the financials we would say that Bharat Road Networks Ltd is a “avoid”. The Company is more of a public welfare company and as of now its not making any money. Until they deliver their projects which are on COD basis they company is yet to recognize its revenue. It could prove to be a worth investment later on but as of now its too risky as the time of delivery of the projects cannot be timed. Until these projects actually starts minting money for the company it shall stay at avoid status.